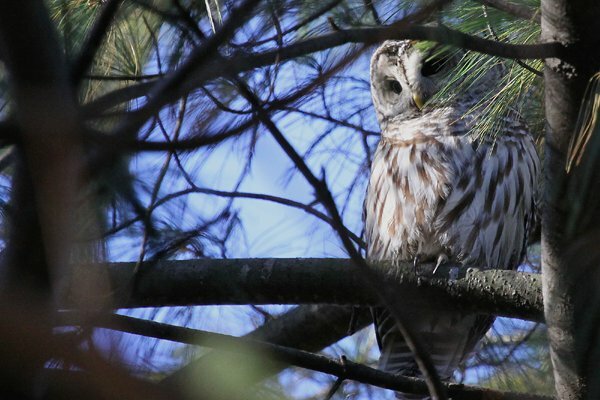 Barred Owl is not a species that most birders expect to find in New York City, much less Central Park. When reports of not one, not two, but three (!) 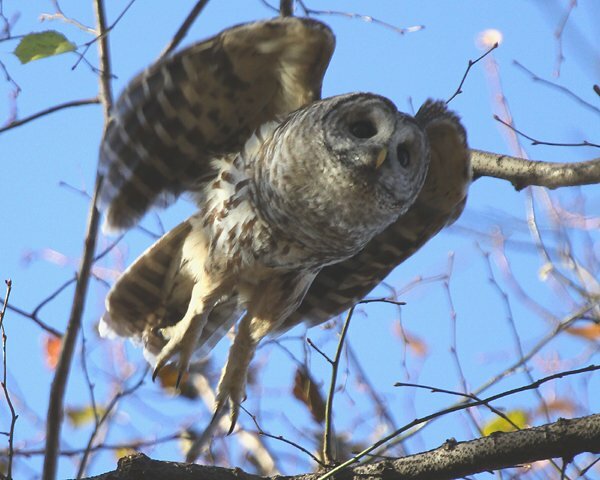 Barred Owls in Central Park surfaced last week I was more than a little surprised and decided that when I had the opportunity I would make my way to Manhattan and try to see a Barred Owl myself. 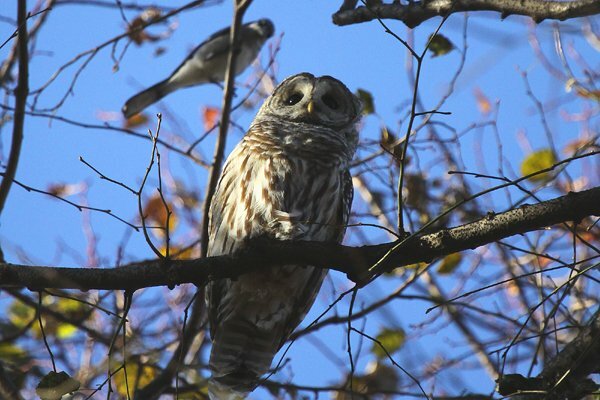 Saturday morning was my first opportunity and I made my way via the F and the D trains to Columbus Circle, at the southwest corner of Central Park, and walked my way up the west side of the park, eventually starting my search for the sole remaining Barred Owl in earnest near the Pinetum. I was pleased to run into Francois Portmann, and we regaled each other with tales of our recent birding and photographing exploits as we searched for Strix varia. We got tired of not finding our quarry so we decided to look for a previously reported Northern Saw-whet Owl and had no luck with that either. (Not that I could have improved upon my recent saw-whet encounter.) 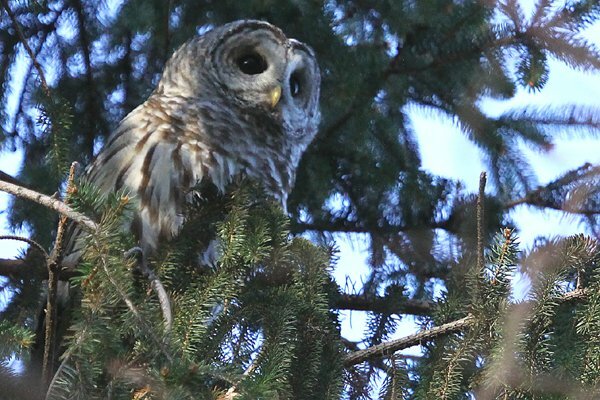 We made our way back to the area where the Barred Owl had been reported recently and were pleased to find that Anders Petolmaa had tracked it down, aided by the friend of birders and foe of owls, a small flock of Blue Jays. It was high up in an evergreen but sitting out in the open, which was nice. Then the jays got too annoying and it flew to a perch that was even more in the open. The jays, however, as you can see in the picture above, were not content with letting the owl stay there so it was once again driven from its perch. 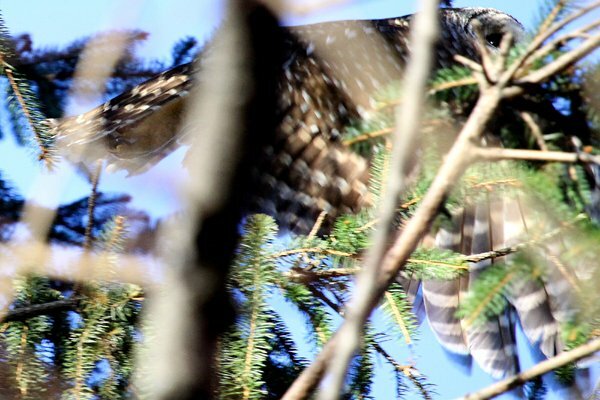 It eventually settled into another evergreen where it occasionally switched perches, getting ever higher and more concealed, until the jays gave up and, eventually, I did too. Now that was a satisfying twitch! Nice bird for Central Park! 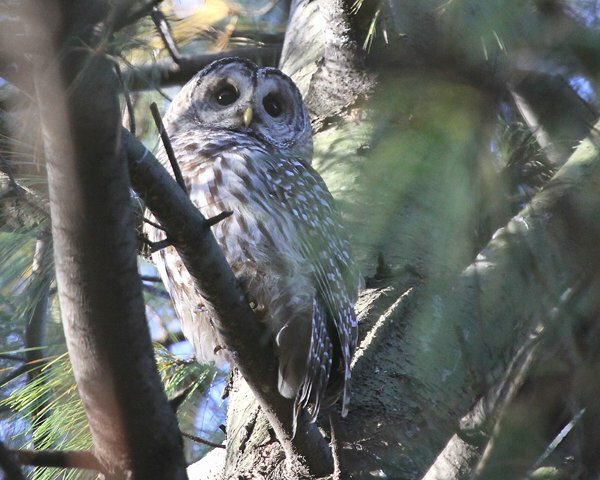 The downtown birders also told me about a Saw-whet Owl that had been found, but alas, I needed to leave the Park of Owls for more mundane appointments.